What do you get when you cross a guy with optic blasts with a girl with serious mind powers? That's easy - a cute chick named Rachel. Rachel comes out of the Days of Future Past timeline of the X-men universe. 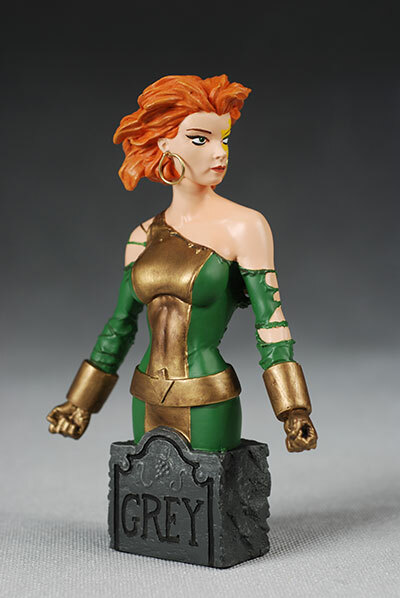 The daughter of Cyclops and Jean Grey, she favored her mother and took on several of her personas, including the names Phoenix and Marvel Girl. 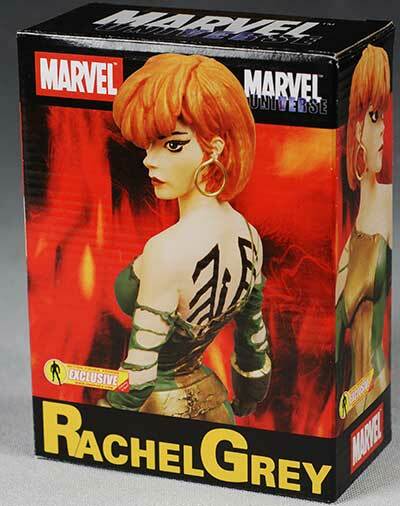 Diamond Select Toys has produced an exclusive pair of Rachel mini-busts for Action Figure Express. There's a regular, short hair version of Rachel (the one to the immediate right), plus the wild hair 'death mark' variant. The 'death mark' is that funky tattoo over her left eye. The regular Rachel is limited to 500, while the variant is limited to 400. You can still pick these up through AFX, or the sponsor Urban-Collectors has some of them available as well. Check the Where to Buy section for details. I always prefer a window box for busts, since I like to see what I'm buying, but these boxes do have some things going for them. As usual with DST, there's a very nice, full color COA included inside, along with the edition size printed on a gold foil sticker on the box. Unfortunately, you have to cut the sticker to get the box open. These boxes are also very small, just big enough and compact enough to get the job done. I like it when they waste as little space as possible and still provide a very protective package. The sculpts here are solid, and any issues are more aesthetic than quality related. Small details are well done, although the comic book style does restrict just how much detail there's really going to be. The detail work on the hair is a big chunky, although both hairstyles are quite attractive and fitting for the character. There's a very...uh...'natural' appearance to her endowments, and the tight fitting battle damaged costume has the appropriate wrinkling and tears. I'm not real keen on the pose, but I'll get into that a bit more in the Design section rather than here. My biggest issue for this category is actually the size. Six inches tall isn't too bad, but she's a bit of a waif (as is the character), and the small sized base adds to this feeling of insubstantialness. While some mini-busts at 6" tall are really sixth scale bodies cut in half, Rachel is more in the neighborhood of a 1/8th scale figure size, and looks a bit out of place with some of the larger, more traditional mini-busts. It's hard to tell in the photos - which is surprising, because photos usually show off issues that the human eye can't see - but the paint is a bit disappointing. There's a fair amount of slop around the hair line, and the use of the washed bronze on the uniform looks more like poorly applied color than worn material. 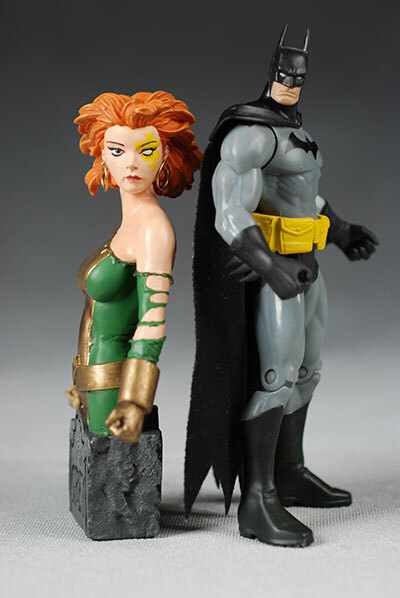 The lips on both figures are a bit uneaven, and the cuts around the eyes and costume aren't nearly as clean as I'd expect on a bust with this level of detail. The design is a bit unusual in the sense that it combines a somewhat dynamic pose with the hands and arms with the much more serene appearance of the face and head. There's something about the pose of the arms and hands that just doesn't work for me with the upright pose of the torso and hips. 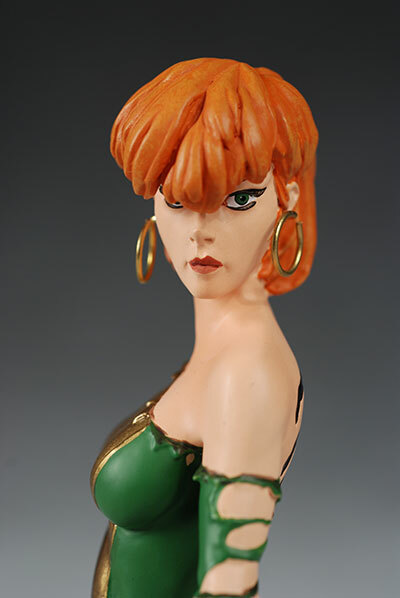 Add in the turn of the head, with her looking over her left shoulder, and you have a very awkward design for me. I do like the use of the Grey tombstone (and by that I mean Grey family, although it's gray in color as well), and the detail work and design there are top notch. It's a very small base, and might be a little more prone to tipping than usual, but it's attractive nonetheless. As mentioned in the Sculpting section, these are pretty small mini-busts, standing with the base at only about 6" tall. The base isn't particularly large either, and at $50 a pop, these are more expensive than the average, larger mini-bust from Gentle Giant. Obviously, the low production run is what's driving this cost, but I think they'll be a hard sell at this price point. When you're handling the bust, keep the earrings in mind. There is a tendency to press inward on them with regular handling, which could result in breaking them off. If these two busts were in the $30 range, I'd add another half star here. I still wouldn't be jumping up and down with glee, but at that price they're decent. At $45 to $50 though, these are clearly overpriced. The small run is what's causing the price to be so high, but I have to wonder if people won't be put off at this price point. Fans of the character should still seriously consider her though, and perhaps if you keep your eyes on Ebay you can get a better price below retail. - Action Figure Express have the regular for $50, and the variant for $55. 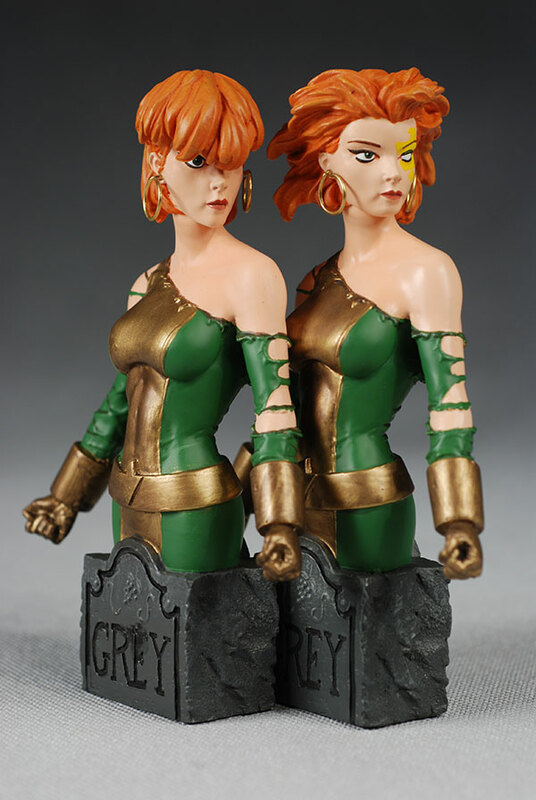 However, they have a special offer of both busts for just $85, saving you an additional twenty bucks if you're buying the pair. - Urban-Collector has a few of them available as well, with the regular at $45 and the variant at $50. - the last one was Wolverine. 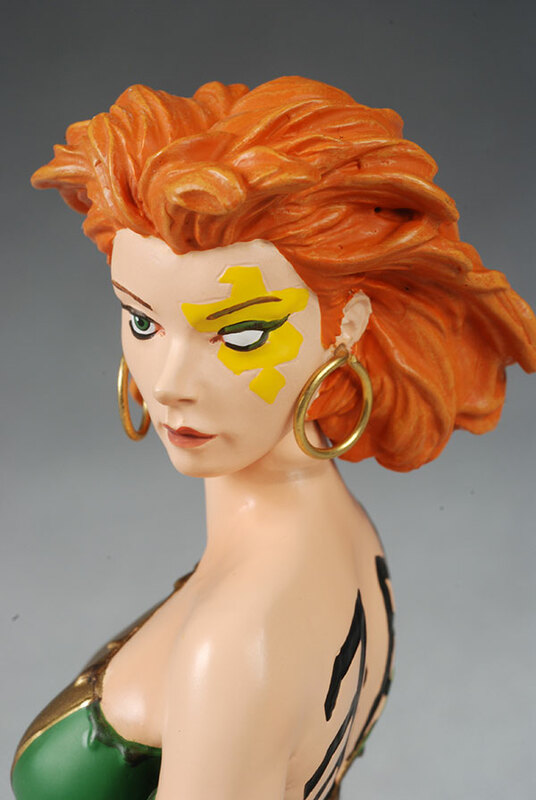 - one of my favs is the Sam Keith bust from Diamond Select, the modern era Wolverine statue from Diamond Select, and there's the very cool X-men Evolutions maquette. - in a smaller scale action figure, there's the recent Toybiz Wolverine, Marvel Select Ultimate Wolverine, Marvel Legends 11 Wolverine, Marvel Legends 6 Wolverine, X-men Classics Wolverine, the X-men 2 movie Wolverine, Apocalypse Wolverine from the ML Giant Man wave, the Marvel Legends 12 Wolverine, the Marvel Legends 3 Wolverine, Marvel Select Days of Future Past Wolverine, Marvel Select Origin Wolverine, and the Marvel Legends X-men Legends boxed set. Whew!